Hi everyone, it's Chris Dark here with you today, and I'd like to share with you a little concertina style fold out booklet that's a style I've always found quick and enjoyable to make as it folds out flat so you can design a scene or simply create a border and add text lines for writing as I've done with mine. 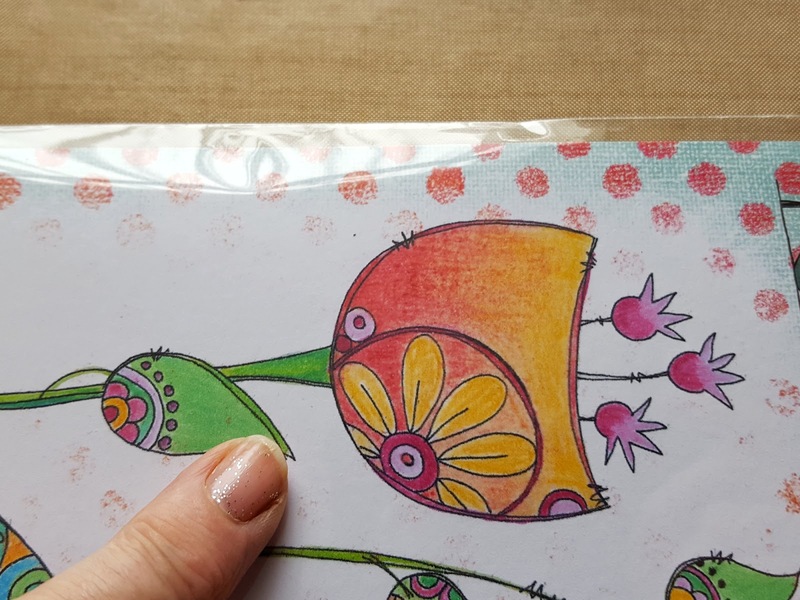 As soon as I saw this stamp set by Jo (Jofy54) I could see the main flower as a bird, the stem indicated a long beak and a leaf could be the wing with those centre stamens suggesting tail feathers! I don't always see stamps in this way and have long admired Lauren Hatwell's quirky take on many stamp sets so I was delighted when the set came to life for me like this. I wonder if I would have noticed the bird shape if I hadn't picked up the set hotizontally, may be it was the way the little circles close to the top of the stem made me think of an eye! JoFY53 and JoFY 54 can be found here. 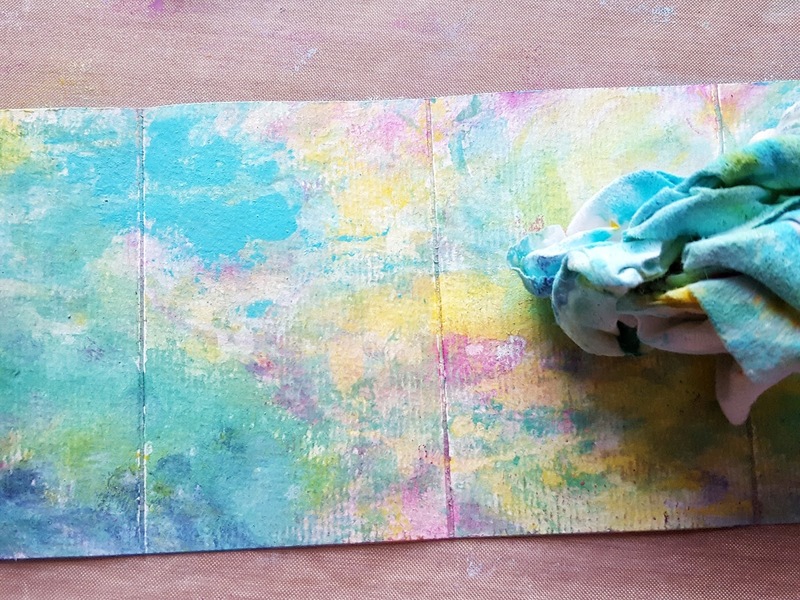 A baby wipe mottled background is one of my favourite techniques for covering large areas quickly and Fresco Finish chalk paints make it enjoyable because of the layering opportunites of the mix of opaque, transluscent and semi-transluscent colours in the range. What I love about this stamp set is that there are element stamps that can be used in a variety of ways, I've used the circular floral stamps to create my border. I added some coloured pencil here and there to the images for a bit of definition, I like to mix mediums together. 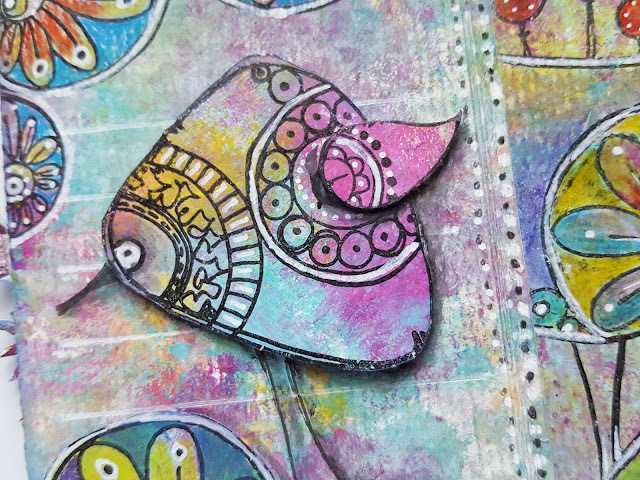 I was pleased with the colourway in my second bird, I found an area of colour on my baby wipe background that I particularly liked and stamped there. I've also added lots of doodles and some shadowing around the bird to finish. This little book gave me so much pleasure to make and I think particularly so because I'd seen something different to portray in my interpretation of the stamps which is always very satisfying. 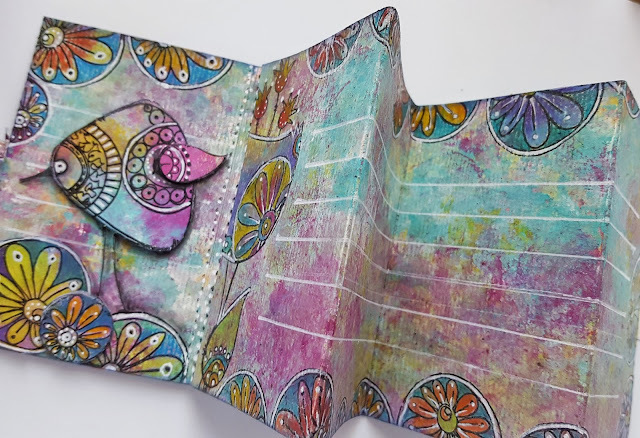 I hope you'll join us in the challenge and show us your own favourite book style, as you can see from my project it doesn't have to be complex, just a matter of scoring a few folds and tying with ribbon! Thanks for joining me this evening and have a happy and creative weekend! Your Lauren-esque take on these JoFY stamps caused a lot of laughter here at HQ! I can't say too much in public (LOL), but they were querying both your medication, and other extra-curricular activities Chris! Haha. Don't worry, I've got your back Chris, your reputation is intact! I love this little book too, the colours are so pretty, and I bet we see a few of these JoFY Birds turning up on canvases and journals! This is a fabulous idea! Smashing book Chris. 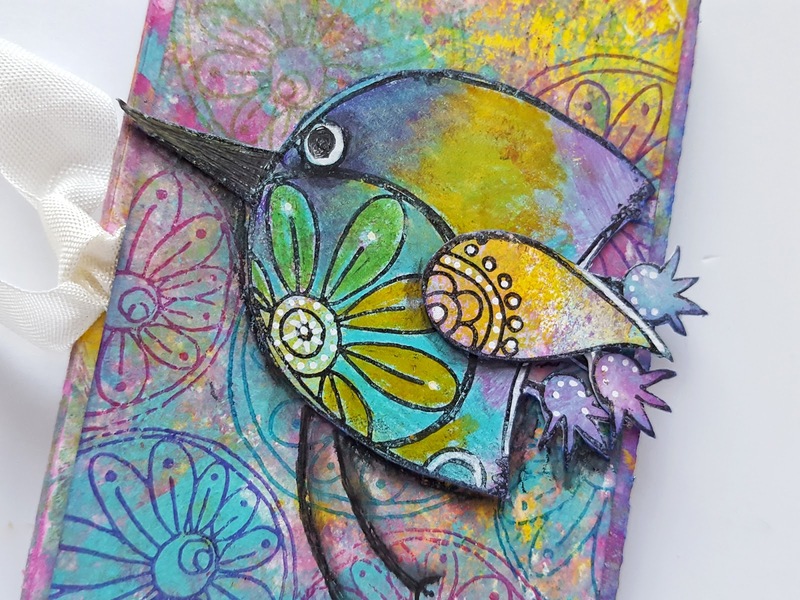 Love the mottled fresco background and you use of the stamps. Real joy to look at and admire. wow, Chris, this is fabulous - I love how you've used these stamps!! the colours are fantastic, too. 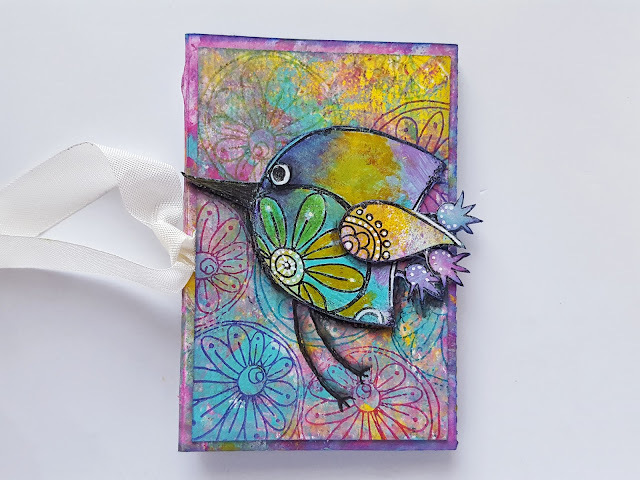 Gorgeous rainbow colours, and such inventive use of the flower stamp to create your adorable little bird. This is so lovely! Chris, this project is astonishing. 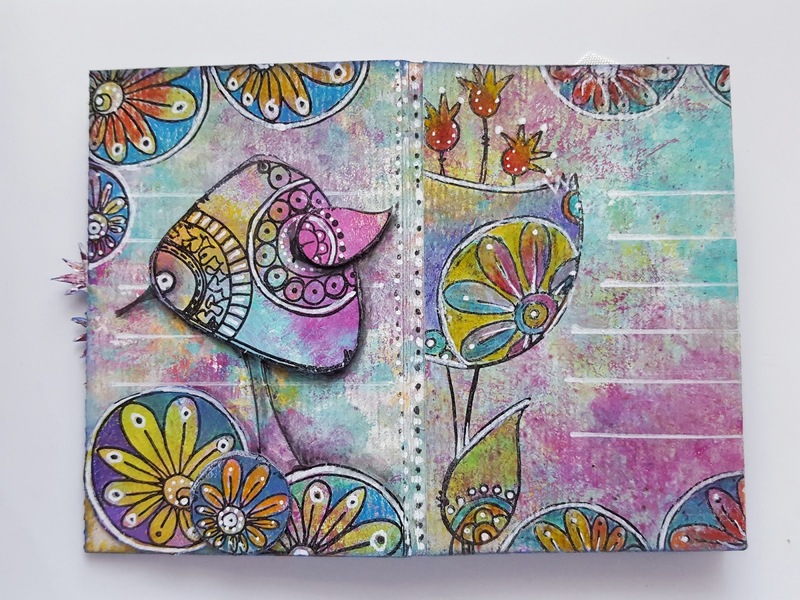 The colors are a dance of happiness and the layout with layers and details is beautifully executed. Cannot wait to try these bits of inspiration on a book. Thanks for sharing. Cheers!